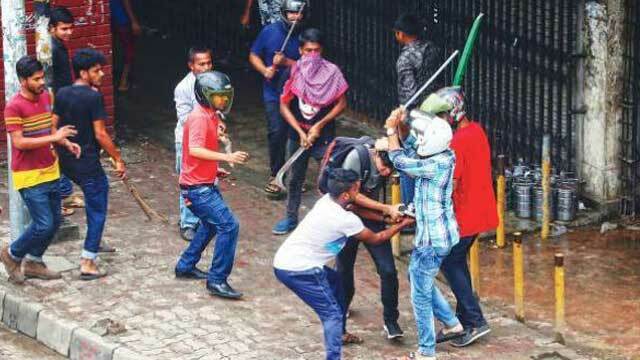 Dhaka, Aug 11 (Just News): Persons wearing helmets and armed with sticks and machetes, who attacked students and journalists during the road safety demonstration, have not been identified, despite clear video clips and photos. The law enforcers are reluctant to probe into their identities. Instead, a total of 22 private university students who were beaten up by the ‘helmeted youths’ were sent to jail on Thursday in two cases filed for vandalism and attacks on the police. Human rights activist Sultana Kamal, speaking to Prothom Alo, asked, if the students could be arrested for clashing with police, why were the attackers not arrested too? 'All are equal in the eyes of law', she added. “If anyone is tortured in custody, then it will be taken that the state is carrying out the torture. We demand the government enforce the law with integrity and credibility,” she added. The father of one of the arrested students told Prothom Alo Thursday that he and his wife do not know from where the police have detained their son, an eighth semester student of computer science. According to Dhaka Metropolitan Police’s media and public relations department, 42 people including the 22 private university students have so far been arrested on charges of vandalism, arson, attack on police and spreading rumours. Nine people including internationally-renowned photographer Shahidul Alam and actress Quazi Nawshaba Ahmed were arrested under the Information and Communication Technology (ICT) Act. Law enforcers on Wednesday arrested Yousuf Chowdhury, 40, chief executive officer (CEO) of the online news portal Zoom Bangla and BUET student Daiyan Alam, 22, on charges of spreading rumours. BUET’s mechanical engineering department student Daiyan has been arrested in a case filed under the Information Communication Technology (ICT) Act. Speaking to Prothom Alo, one of Daiyan’s intimate friends said nobody could realise what was really happening in Dhanmondi-Jhigatola areas on 4 and 5 August. And that sparked off the rumours. At that time his friend uploaded a post on his Facebook. He wrote no incident of deaths happened there, no girl student went missing. He mainly tried to stop rumours. Later a top leader of BUET unit of Chhatra League shared the post. Daiyan is innocent. However, he was in favour of the student protest demanding safe roads. He used the photograph of a poster as his profile picture on Facebook and so was arrested. During investigations, it was found that those who were arrested were the ones who took to the streets or uploaded statements demanding safe roads. They were accused after some of their statements were proved to be false. Police have not arrested anyone of the ‘helmeted force’ who attacked the students and journalists. Since the day of attack, the victimised journalists and students claim the attackers were the leaders and activists of ruling party Awami League-backed student wing and youth front. Photos of some of them are on the social media. According to leaders of BCL, one of those, who attacked journalists at Science Laboratory area, is a leader of Chhatra Dal, student wing of Bangladesh Nationalist Party. Police, however, did not clarify any of the claims. Dhaka Metropolitan Police (DMP) headquarters joint commissioner (crime) Sheikh Nazmul Alam told Prothom Alo that the police’s Detective Branch was trying to identify the attackers.